Intrigued by human behaviour and artful self-expression, and gifted with an ear for deep and detailed listening, Mo has worked with top performers and leading creatives from around the world for over 30 years, successfully helping them extract their unique brilliance and embody their innate freedom, to live aligned and embodied in their greatest personal and professional potential. 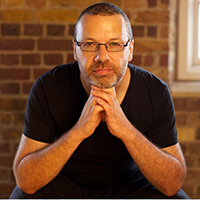 20 years in the London music industry as a freelance recording engineer and music producer, eliciting ever better performance and expression from international recording artists, alongside 10 years as an International trainer/assessor for industry qualifications in music production and multi-track recording. 7 years producing over 300 world-class live events and digital products with highly-acclaimed International speakers, authors and leaders in business, relationship and spirituality, including Anthony Robbins, Dr. John Demartini, and currently as audio producer for David Deida. Now based in Australia, Mo’s clients today are extraordinary entrepreneurs and leading creatives from all over the world, already highly successful, yet seeking something more – deeper personal fulfilment, to serve with more meaningful impact, to live a truly embodied life, to enjoy greater freedom, authenticity and alignment in everyday interpersonal engagement, purposeful business, open-hearted relationship and deeply connected sexual intimacy. Mo has built a truly unique lifestyle business, deeply aligned to his values and passions, he shares an extraordinary, playful and passionate relationship with his partner Lisa Page, and works with clients from around the world to do the same.